Race against Mr. E’s devilish Oni Bike with Zane’s super-cool bike. Fold out the stud shooters and aim them at the Sons of Garmadon villain. Beware of the Oni Bike’s spiky chopping blades and stud shooters. Launch the drone to attack from the sky. You must get to the Oni Mask of Vengeance before Mr. E and stop him powering up with the Demon Torso and 2 extra arms! 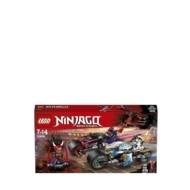 - Includes 2 minifigures: Zane and Mr. E.
- Zane’s bike features a minifigure seat, 2 stud shooters on a foldout, detachable drone, 2 foldout gold-colored blades, a flag element and translucent, ice-blue elements. 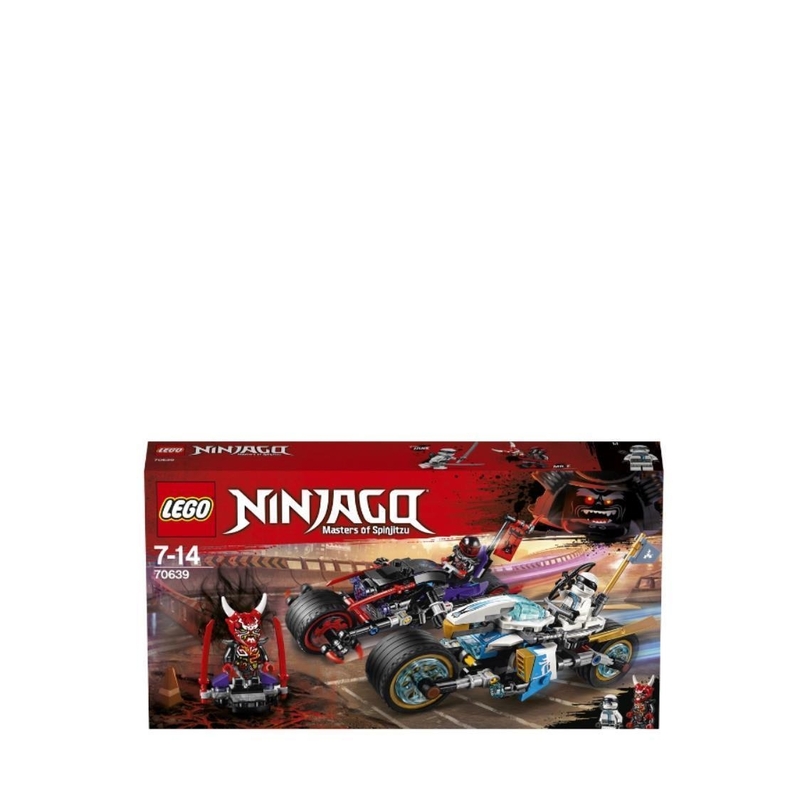 - Oni Bike features a minifigure seat, 2 chopping blades with spikes, 2 stud shooters, front wheel with spikes, 2 detachable swords and a ‘Sons of Garmadon' flag element. - Push the Oni Bike along to make the blades chop. - Also includes a podium with the Oni Mask of Vengeance and Demon Torso transformation elements for Mr. E, plus 2 katanas. - Attach the Demon Torso (with 2 extra arms) and Oni Mask of Vengeance to Mr. E to make him even more evil! - Includes Zane’s bow-and-arrow weapon. - This cool toy for kids is suitable for ages 7-14. - Zane's bike measures over 3” (9cm) high, 6” (17cm) long and 2” (6cm) wide. - Detachable drone measures over 4” (11cm) long and 3” (9cm) wide, and under 1” (2cm) high. - Oni Bike measures over 3” (9cm) high, 7” (18cm) long and 2” (7cm) wide. - Podium (including mask and torso) measures over 1” (5cm) high, 1” (4cm) wide and 1” (3cm) deep.